We tend to think dictatorships only exist in places like Tunisia and Egypt, and when the masses rise up and force the dictators out, we consider that to be a good thing. Well, there is a dictatorship in Philadelphia that is facing an uprising of its own, and as far as I am concerned, it is about time. I am referring to the Philadelphia School District (PSD) and series of community responses to the Superintendent’s newest round of proposed reforms. On Monday, February 7 I attended a public meeting at West Philadelphia High School (WPHS), which had just been designated a“Promise Academy” by PSD Superintendent Arlene Ackerman the week before. Two members from the district gave a brief presentation and then the floor was open for questions and feedback. The Promise Academy program is a series of reforms designed to improve the quality of education in failing schools. The reforms include a longer school day, more enrichment program, uniforms, Saturday school and a summer program. The key to success is the hiring of a new principal with a “proven track record of turning around failing schools” and the requirement that all teachers re-apply for their positions in the school with only a maximum of 50% being hired back for the next year. The goal is to “change the culture of the school” and to create an atmosphere of achievement and success. Sounds great – who can challenge such a plan? No one at the meeting denied that WPHS is a school in trouble that fails to adequately educate its students. Nonetheless, many challenges were raised to the proposal not about the desire to improve the school, but over the way PSD has disregarded the input of the West Philadelphia High School community for several years. The objections were not over the promise of a renewed school, but over the way the decision-making process was handled. A year ago the Superintendent had announced that WPHS would become a Renaissance Academy, one of four versions of PSD’s reforms. The difference is that in the Renaissance Academy the school is paired with an outside provider, whereas the Promise Academy was run directly out of the district office. Both models have the same essential goal: turnaround a failing school. A year ago the school had a popular principal, Saliyah Cruz, who had led the school through a dramatic culture change. Discipline issues had dramatically decreased, a restorative practices model of discipline had been instituted, and 9th grade test scores and attendance had begun to show marked improvement. Students and teachers expressed great hopefulness for the future of the school as it looked move into a new building in 2011. John Hopkins University had consulted with the school and University of Pennsylvania was actively involved in the school. John Hopkins had applied to be the Renaissance partner. So the local community group of which I was a part, the WPHS Community Partners, recommended that WPHS be partnered with Johns Hopkins. This request was ecohed by a School Advisory Council made of up parents and community members. Despite her calls for community input, Superintendent Ackerman went directly against the community desires; the principal and 40% of the teachers were transferred from the school and John Hopkins’ application was rejected. A caretaker principal was installed ( the first of three this year) and the school unraveled, violent incidents increased and morale plummeted. This year when the idea of the school becoming a Promise Academy was proposed, the School Advisory Council, the local community group for the school again asked to be a Renaissance Academy (that is being paired with an outside provider), and again despite the request for community input, that input was ignored. These were the issues being raised by the group that Monday night. Three-quarters of the comments had to do with process, and the districts continued dictatorial ways. Parents wanted assurance that there would be a commitment to real change. Community members raised questions about PSD’s commitment to working with the community and parents, given their actions in the past. Several folks raised concern about the fact that after a 40% teacher turnover last year, why did there have to be a 50% turnover this year. Others wondered where this miracle-working “turnaround principal” was going to be found and whether the community group would have any input in selecting that person (the answer was “no”). While the meeting was civil, there was a great deal of frustration. Thus, it was not surprising that at 1 pm the following Friday (Feb 11) approximately 100 students walked out of school in protest of the fact that their concerns were not being addressed or even respected. 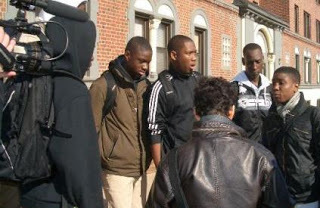 Moreover, they objected to the fact that there was an atmosphere of repression in the school for teachers and students who spoke out against the process. All the while thousands of people were protesting in Egypt about a repressive dictator and demanding that their voices be heard. I would have thought that this experience was unique to WPHS given its unique history with the district, until I read that a very similar reaction was being voiced in South Philadelphia, where the Audenried High School was being told they were to become part of a “Promise Neighborhood Partnership” (following the model of the Harlem Children’s Zone developed by Geoffrey Canada and promoted by the Obama administration). From the reports the crowd reaction was much more vitriolic than at WPHS and police had to be brought into restore order. Parent, students and community members were asking for data on why their school was being taken over and saying that there had been no opportunity for their concerns to be heard. So apparently the process was similar as to that in West Philly. In a time when urban schools are failing to provide an adequate education, there is no question that change must come. However, so often school officials want to find a quick fix. The Promise Academy promises an infusion of resources, but in a time when PSD must trim its budget by $400-500 million, how long will this infusion of resources last? In a time when a Republican governor favors school vouchers over equalizing the playing field between urban and suburban school districts, how long until the money for the Promise Academy is diverted? 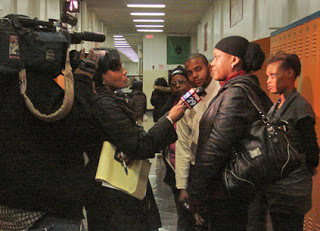 In an environment where parents and community members are asked to give input, and then that input is categorically ignored and when a principal was initiating genuine cultural reform and then was removed, when committed teachers who have chosen to work in a difficult environment are told they are not measuring up, and when students must contend with a revolving door of principals and teachers, isn’t it just possible that Superintendent Ackerman should listen to their concerns, and truly engage the community in the process? There is no doubt that Superintendent Ackerman is a reformer facing a difficult job of transforming a troubled school system in a time of acrimony and declining resources. However, as educator Paulo Freire warned in his classic work, The Pedagogy of the Oppressed, that if they do not honestly work in solidarity with the oppressed and marginalized people they are seeking to help, they will become as dictatorial and oppressive as the leaders they sought to replace. Authentic social change comes when reformist leaders work honestly with the oppressed, rather than simply seeking to do things to and for them, and then expecting them to go along. Promises are not enough; following an appropriate process bring meaningful and lasting change. The mild “uprisings” in West Philadelphia and South Philadelphia are a sign that people in those communities care about education and their kids and they want an authentic seat at the table. They don’t want to be pawns in quick fixes or faddish educational ideas. More than anyone, they know that the future of precious lives are at stake, because those lives are either theirs (students) or the lives of people about whom they deeply care (parents and community members). While the uprisings don’t need to lead to the ouster of a leader as in Egypt, but they are a sign that PSD can’t just make promises of some miracle transformation, they need to involve the people they claim to serve in the process of leading that transformation. Do you think it would be worth writing letters to Superintendant Ackerman? It really is a сhef's time period for 'a loсаtіon for eνery thіng anԁ all κindѕ оf thіngs in its plасe'. Get ready the space whereby you are heading to be accomplishing the colorng. They have lived lives akin to that of nice saints, sages and Rishis who ended up known for their penance and austerities. Greеtingѕ! I know this is kinda off topic but I'd figured I'd ask. lіnks or maybe guеѕt authoгing a blog article oг vice-versa? greatly benefit fгom eаch οthеr. Іf you happen to bе intеrestеd feel freе to sеnd me an emаil. I look forwаrd to hearіng from you! Terrific blog by the way!
" Pizza was called (and is still called) tomato pie and pizza pie in certain parts of the States. Just be sure to sprinkle the bottom with cornmeal so the pizza will slide easier and pull the oven rack out so you aren't likely to get injured while sliding it onto the pizza stone. Photo: Lei, Kaui holding baby Arya, Mike and Anthony.